Celebrated by style conscious and trend-savvy shoppers, Forever 21 has quickly become the source for the most forward fashions at the greatest value. Forever 21 features exciting store environments, a constant flow of fun and creative clothing designs and the accessories to make your look come together at the right price. Perfect gift for the style conscious and trend-savvy shopper. Forever 21 gift card makes the perfect gift for any holiday, on special occasion or anytime of the year! 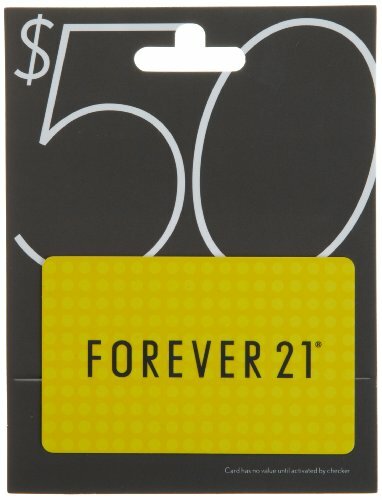 Gift Card may be used purchase at any Forever 21, XXI Forever, For Love 21, Heritage 1981, Reference or Gadzooks store in the U.S. and U.S. territories, or online.